The word hotel doesn't really fit the vigilius mountain resort. The vigilius is more a "out-of-the-ordinary-place", hard to place into any one category of experience. To describe it, effectively you have to be creative. It could be called an "inhabitable cloud", a "modern monastery", a "cathedral of relaxation" or even an "indoor forest". The vigilius mountain resort is located at an altitude of 1,500 meters, reachable only by cable car and far away from daily hurry, tension, stressful meetings, noise and pollution. On the Vigiljoch mountain, guests won't see cars, the mountain up here is a protected car free area, where man is very close to the sky and to an unknown serenity. 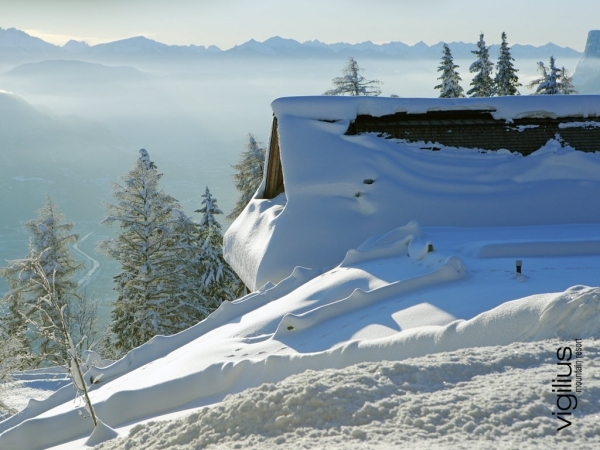 Conceived by the local entrepreneur Ulrich Ladurner and designed by the international well known architect Matteo Thun, this privileged place is able to cancel from the mind all thoughts of past and future. Here everything turns around tranquility. There is no television in the rooms, and the number of children admitted to the hotel at any one time is limited. All kind of noise seems to have been banished. In exchange, guests will find slow and gentle movements, lot of local larch, clay walls in the rooms which radiate warmth during the cold winter days, panorama windows all over the resort offering amazing views on the far Dolomites (since June 2009 UNESCO World Heritage Site) and the deep green of larches and meadows, crackling fireplaces and a fantastic panoramic endless pool as well as an outdoor whirlpool set among the trees. In the vigilius mountain spa guests will forget time and space just feeling and living in the now and yet. The spacious rooms and suites with their minimalist décor seem to absorb the personality of whoever occupies them, without ever imposing their own. Everything is light and warm. The silence of the vigilius is so enjoyable that guests feel to protect it. This detail helps to create a magic atmosphere of total relax for body and mind. Guests can borrow books in the library near the central "vigilius piazza" where they can relax in one of the comfortable couches and armchairs in front of the fire place or outside on the Val d'Ultimo terrasse. They can read or simply give themselves up to contemplation. In the Restaurant 1500 chef Mauro Buffo draws on his inexhaustible culinary resources, and casts his insights into an intelligent mould that enchants not only the palate but also the brain. In the chef's creations the concept of regionality is reinterpreted and complemented by ingredients, their combination and cooking techniques hailing from other sources. Accordingly, they open up refreshingly new perspectives of the local cuisine, giving rise to a colourful, modern, even avant-garde offshoot of classic South Tyrolean cooking that enchants visitors by marrying the region's scenic and culinary wealth with the imaginative genius of an internationally experienced chef. While Restaurant 1500 cultivates an outgoing, urbane culinary language, the cuisine of the Ida Parlour - open even for external visitors - tends to be introverted, focusing on introspection and reflecting on the location and what it stands for. In the Ida Parlour the kitchen team seeks to explore the roots of South Tyrolean rustic cookery and to present guests with a cosy at-home feeling while meeting their desire for culinary authenticity. In a world in which "doing" has become an obligation, people go to vigilius mountain resort to do nothing in particular. Those who wish, of course, can follow - without additional costs - one of the activities offered in the "move & explore" program like walking and experiencing nature and the mountain, following the Five Tibetans offered by personal trainer Andreas, learning how to do archery or simply enjoy the few simple ski pists and the crasy toboggan trail on the mountain. Without any obligation: If not that of feeling at ease with yourself and in complete harmony with a nature that here reigns supreme. Tucked discreetly into the Southtyrolean Mountains, vigilius mountain resort is a true merging of nature and architecture. The remote 3,5 acre (14 hectare) site in the village of Lana near Merano (Italy) is reachable only by cable car or, why not, by foot up to 1500 meters. The beautiful expanse of the Vigiljoch Mountain inspires vigilius' mission of holistic health and environmental conservation. Indeed, the Vigiljoch Mountain landscape is not just thougt of as the backdrop, but as the essence of the place. The pristine stillness outside is meant to mirror a renewed sustainable spirit inside. In keeping with the connection of the landscape, the Milan based star architect Matteo Thun brought together organic architecture and fine design in his native region (he's born in South Tyrol but lives and works for more than 25 years in Milan). The result was a mountain resort emphasizing the very natural site. The low-lying building is designed with local materials, used in their natural states, comprise the very shooting contemporary architecture. The feeling of a private "tree house" emerges from the network of larch shade-giving slats encasing the building and a natural sod roof on the top. The water from Vigiljoch Mountain is high quality spring water, used for both drinking and bathing. The prevalent materials used throughout the entire resort are glass, silver quartz, clay and larch wood: Untreated on the exterior of the building and weathered to a silvery grey, left natural in the interior, or white-washed, oiled or stained. Throughout the entire building the glass parts of the façade feature insulated triple glazing. The flat roof is also extremely well insulated with high-quality thermal material. The high-quality thermal insulation ensures very low heat requirements despite the exposed site, generous glazing and the higher temperatures required in the spa areas. In summer, excessive heat build-up is prevented by the lattice-work protecting the façade from the sun, thermal masses and a ventilation system while the air-tight design of the building shell avoids drafts. Thanks to several awards in the field of sustainability, vigilius mountain resort is considered a pioneer in ecological tourism. 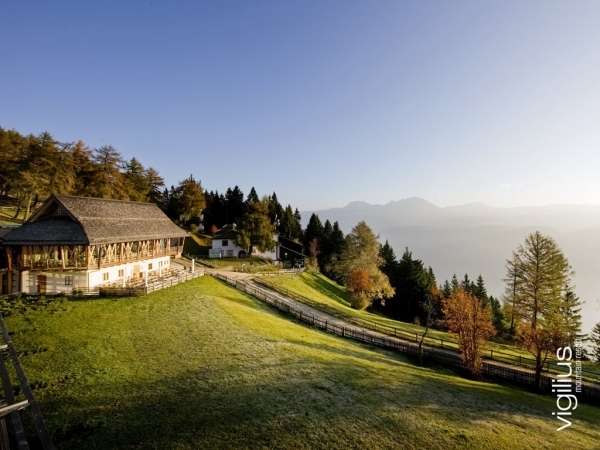 When awarded the the "Climate House A" in 2005, the Italian environmental Minister emphasized the ecological role-model function for the hotel business and for tourism, not just for the South Tyrol, but nationwide. Consequently, the vigilius mountain resort was and is still now exemplary for other tourism enterprises through its holistic philosophy, which is convincing not only through its use of renewable energy sources, but also through its cleverly conceived climate concept. The impressively low energy consumption of less than 30 kWh per sqm would not have been imaginable at 1200 m altitude above sea level without optimal insulation through triple-glazed windows. 2005, the Italian WWF Association "Panda d'Oro" conferred the special prize "Climate Friends"
2006, "Award for environmental innovation" by the Italian environmental association "Legambiente"
2009, Vigilius was awarded with the 5 Green Stars by "Eco Hotels of the World"